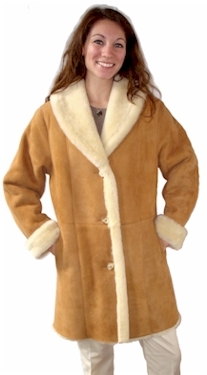 3/4 length ladies Shearling coat with a wide collar to pull up for extra warmth, on cold winter days. Featuring 3 buttons and a 4th under the collar, if you want to button it all the way up. Horizontal pockets and adjustable cuffs. Approximately 33" in Length. Available in color shown. Icelandic pelts are an extra light weight, exceptionally soft and supple hide, with equally soft fur.